Capcom has severely left Mega Man fans in ruins over the last 5 years. From cancellation to cancellation (Mega Man Legends 3/Maverick Hunters X) to re-releases of games you’ve played countless times over (Mega Man Legacy Collection, and just this week, Mega Man Legends on the PlayStation Network). It’s clear that now Capcom is testing market interest in the blue bomber, but what are fans to do until then? Kickstarted Mighty No. 9 by Mega Man series creator Keiji Inafune is looking to scratch that itch, but delay after delay as the release draws closer is also pushing fan interest away. Luckily, out of nowhere comes Batterystaple Games with 20XX! Unlike Mighty No. 9, 20XX was made in the public eye and is available in its current beta form for public consumption. But can it hold a candle to the series it draws inspiration from and stem the appetites of Mega Man fans? As any self-respecting fan of Mega Man can tell just by looking at the title and my lengthy opening statement how this game will play. You walk around, jump, and shoot. While there are minute complexities beyond this such as charge shots and wall jumping, those are the basic controls. Strangely however, unlike Mega Man, 20XX’s controls are an odd representation of what you’ve come to expect. While Mega Man games give you precise controls, giving you responsibility for every situation you find yourself in, 20XX just has a different feel to it. You feel floatier, yet you fall faster. You dash but you don’t jump as far as you might expect if you were playing Mega Man X. It’s definitely still playable, it’s just not as good-feeling as the games they draw so much inspiration from. You might find yourself asking, “What makes 20XX so special then? It’s just a Mega Man game with different controls, why do I care?” 20XX is a roguelike. Levels are different every time you play them, the bosses are in different orders, the stages are randomized from a mixed bag of many, and lastly, there are no continues; as you level up your character through “E-Tank” pickups and Boss rewards, you hope nothing big and scary is on the next screen ready to ruin your great run. 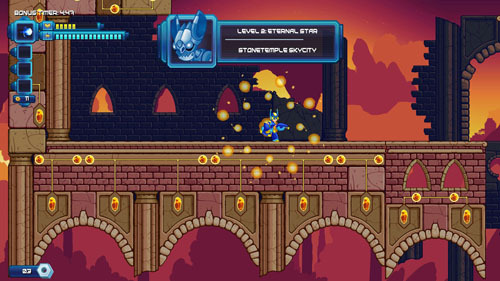 It’s a very interesting concept and leads to a fresh feeling Mega Man clone, with a Binding of Isaac-esque replayability to it. You collect everything and even unlock cosmetic changes and new game modes (such as a boss rush or twice the enemy spawn). 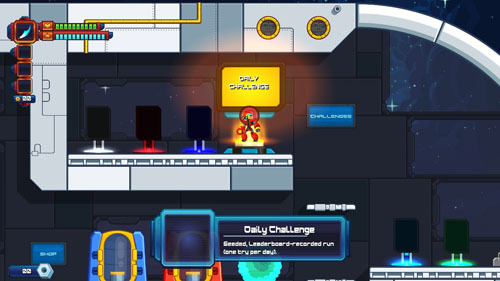 There are even daily and weekly challenges that test your mettle and put you up in leaderboards against the world. 20XX is a gamer’s game and it expects you to bite the hard bullet of defeat a couple of times before you win. In a world of polygons, realism, and visceral effects, side-scrollers have a hard battle making it to the top of somebody’s playlist. To do this you must have really nice animations and a great art direction. 20XX has 1½ of these. The game flows really nice at a decent framerate (especially for what the level generator comes up with for later levels), and the effects for charging your shot and taking damage look good and tell the player what’s happening, but the art style is lacking. 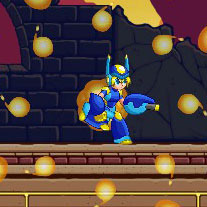 It’s clean and very Mega Man X looking, though in doing so it seems uninspired. Rather than blow us away with new character models BASED on Mega Man, we’re given a blue character with a helmet and big legs, and a red character with a helmet and big legs. The enemies are all throwbacks to Mega Man enemies as well, leaving not much left to do in the art department, but change it just enough to avoid copyright infringement. That being said, the game doesn’t look bad at all, the sprites are very crisp and the backgrounds are varied and have nice focus, they’re just not very creative. Something to be expected of a game working off of fanservice. When many people think “Mega Man” thoughts of its great music come to mind almost instantly. Mega Man 2 with its legendary 8-Bit intro. The many stages that earwormed their way in your head as you trial and errored the ever-loving crap out of them. Mega Man is very well known for its great and iconic soundtrack. So how does 20XX hold up? Well it holds up alright. The music in 20XX sounds like the same sounds used to make Mega Man X’s music, freshened up, and then put back together not as well. Don’t get me wrong, the music sounds good, it’s nostalgic and calls back to the games like it’s meant to, but you won’t be humming these tunes after you put the controller down (keyboard if you roll that way). Finally, this is where 20XX would love to shine, and I’m happy to report: it does. The online multiplayer is there but not fit for use in anyway whatsoever, it’s the local co-op that makes me want to play more 20XX. It feels like playing a beat ‘em up, except you’re playing a Mega Man game! When you have a partner with you and you’re working together, it’s just so satisfying, especially when you know that there’s no continues, and you need to keep progressing together. You both power up, you both platform and survive, and you both just have great fun. It runs perfectly fine and is balanced almost flawlessly for two big-legged cyborgs coming in to ruin the days of the droning robot animals. Touted as a “co-op-friendly action platformer roguelike,” 20XX really seals the deal, despite my inability to access the online capabilities. 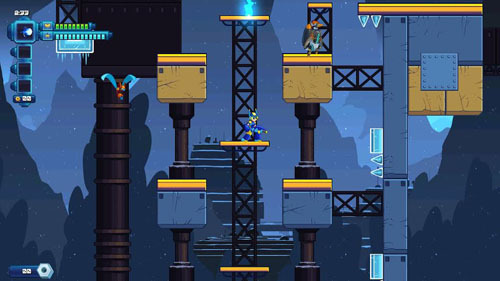 20XX lures you in with an inviting Mega Man X vibe that makes the inner 90’s kid in you shriek and keeps you hooked with Daily Challenges, Collectibles, and an ever expanding cache of platforming goodness every time you start a new game. Despite it being awkward to pick up and play at first, the Local Co-Op and a good friend makes this $12 purchase easy for any Mega Man fan(s) worth their salt. ← Dragon Age Inquisition (Xbox One) review.